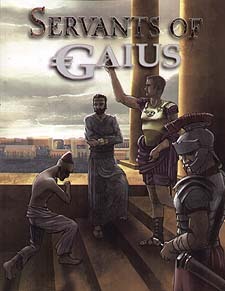 Unravel sacred mysteries and explore the empire in this unique alternative Roman history setting where a mad emperor is saviour of the world. As Neptune's armies threaten the empire, Gaius Caesar Augustus Germanicus ("Caligula") creates a secret order to root them out. The Servants of Gaius come from all the ranks of the Empire, chosen by the Divine Emperor himself. In their quest to save Rome they face dark cults, backstabbing politicians and even the gods themselves.